Thanks for the Memory to the Colossus via The Llama Butchers, and also to Villains Vanquished. Over the course of the last three years or so, in the ongoing discussion of the war in Iraq, one of the memes that opponents of the war throw in the faces of supporters is the the epithet of "chickenhawk". 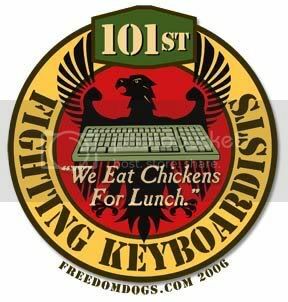 They've even come up with a nickname for pro-war bloggers -- "The 101st Fighting Keyboardists". I've always thought that the "Chickenhawk" argument was disingenuous at best, especially when it's used as a rebuttal to arguments for the necessity of the war. So what's your point? Are you say I'm a hypocrite for making the pro-war argument, but not fighting myself? Maybe I am, maybe I'm not -- judging me on that point would require that you know a HELL of a lot more about me than is possible, considering I don't know you from Adam. But even if it were true, it has nothing to do with the validity of the argument I'm making -- it's an ad hominem attack. Or are you saying that only those who serve are qualified, either morally or by merit of experiencial knowledge, to have an opinion on matters of national defense? I seem to recall that when Robert Heinlein proposed that system in Starship Troopers, it was decried as "fascist". And if you truly believe that, doesn't that disqualify YOU from speaking out on these matters as well? Sauce for the goose, you know. And what about the 132 million Americans who let only 4 millions fight for them in WWII? And are we all hypocrites for believing in laws, but not joining the police force? No, sorry, this argument doesn't hold up. While those who serve have earned a greater level of respect and honor than the rest of us, and while their acheivements in service of the country may make their qualifications for leadership more evident, they are no more qualified (or less, for that matter) to form and express opinions on matters that aafect us all than any of us are. Beyond the logical inconsistency of the "Chickenhawk" attack is the personal nastiness of it. It states, often explicitly and always at least implicitly, that those who support the war but are not enlisted in the military are too afraid to fight. In fact, this insult is at the core of the supposed hypocrisy in being a chickenhawk -- why else the word "chicken"? But it commits another fallacy, that of the false dilemma -- it ignores a panoply of possible reasons why a person would be willing but unable to serve, and it ignores the fact that many of those who are not currently serving HAVE served in the past. I can't speak for veterans, but I should think they find this particular attitude insulting. So that's why I'm joining the 101st. Yes, I support the war. It is horrific, and tragic, but not nearly so much so as the alternatives. No, I am not enlisting -- I tried that route, years ago, and got a "don't call us, we'll call you" brush-off from the Navy. But if I can't fight, I'll at least do my part by making sure that I honor those who can -- and do.